As I’m playing catch-up I was confused having a photo of a meal from the 2nd as I went out for lunch with my Mum and Sister. I should feel guilty that I had two meals but there’s nothing too fatty here though and I did only have a ‘fishfinger sandwich’ at a place called Bill’s in Sheffield. A special mention has to go to our burgers and at Bungalows & Bears yesterday. I’ll be seeing you again. I’m working my way around the Donna Hay book. Did you see Sunday Brunch on the 13th? I thought Rimmer and Ms Hay were quite flirty! 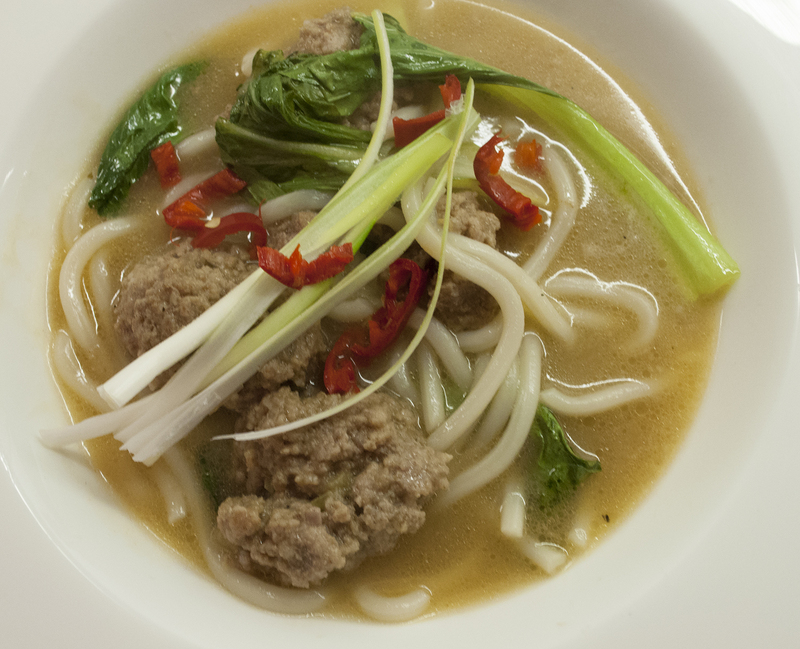 Mix the pork, ginger & hoisin together to form small balls. Pop in the fridge to chill. Pop the stock into a pan and add the rice wine and the five spice powder. Bring up to a high heat then add the pork balls. Simmer until cooked through then remove from the pan. Add the noodles and simmer for a couple of minutes. Add the pak choi for a minute then return the pork to the pan. Cook for a couple more minutes then serve topped with the spring onions and the chilli. This is, more or less, my 10-year-old’s favourite dinner. Then your 10 year old has great taste!